What’s better than the smell of bread baking? 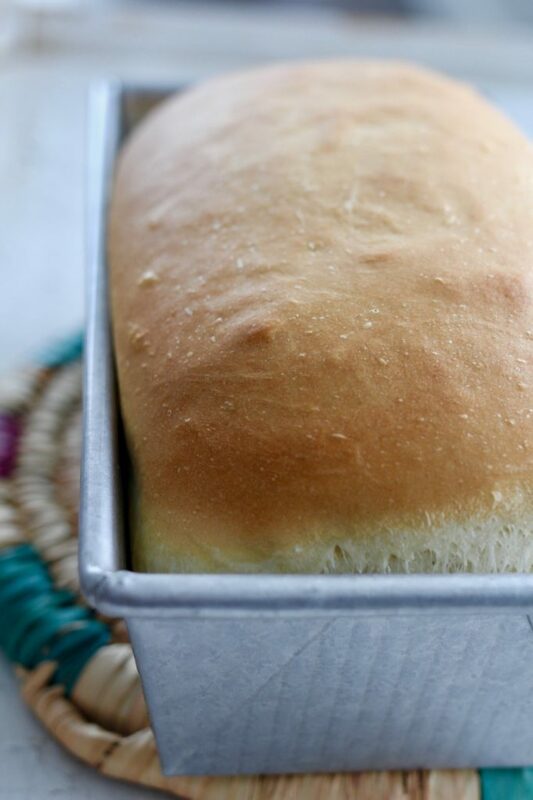 If you haven’t ever made a loaf of bread, this is the perfect recipe for you. 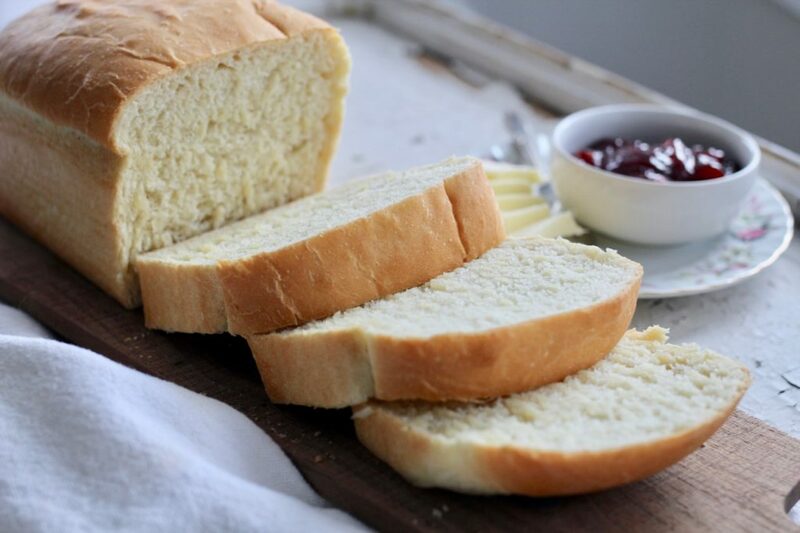 ABK’S Classic White Bread Recipe is a basic, no-frills recipe for one loaf of delicious classic white bread just like Grandma used to make! 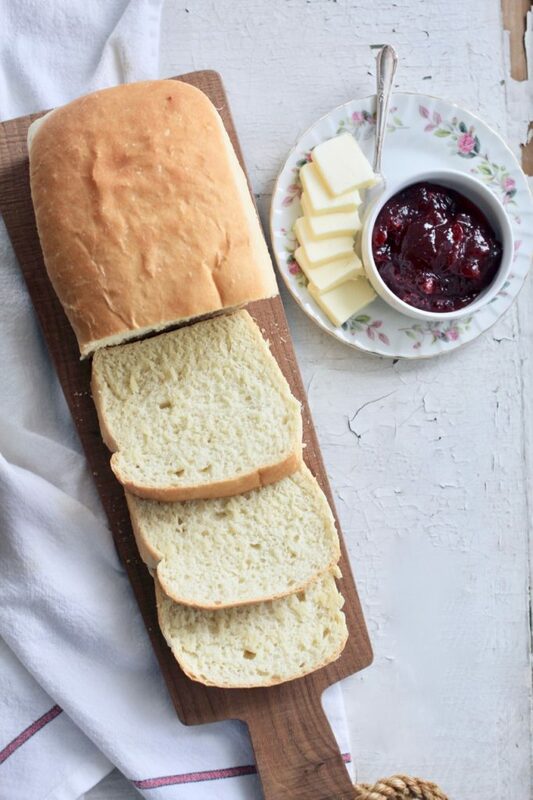 When was the last time you baked a loaf of classic white bread? If you associate bread making with: a huge mess, lots of loaf pans, hours of mixing, kneading, rolling out and rising I’m sure you are not alone! ABK’s Classic White Bread Recipe takes one bowl, one loaf pan and less than two hours, most of which is rising and baking time. 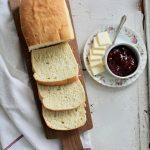 There are so many reasons that you should be using ABK’s Classic White Bread Recipe and making bread at home from scratch! It’s so much easier than you might anticipate, and so much tastier than anything you’ll buy at the grocery store. This classic white bread recipe is also perfect if you’re not too familiar with bread making. Have I convinced you yet? When I was a young, my Aunt Gloria taught my mom how to make cinnamon rolls and white bread, which was a new adventure for my mom. I think Aunt Gloria’s recipe for bread made 6 loaves! Yes, 6 loaves. Back in the day, (my grandparent’s day) people used to make bread, instead of purchase from the grocery store. Most household’s had a day set aside for cleaning, a day for laundry, and a day for baking bread. Now, we make bread to enjoy a “hot out of the oven” loaf, instead of out of necessity. This recipe makes one loaf of bread, but you can easily double the ingredients to make two loaves! I use bread flour in this recipe because it gives the bread a bit more of a dense texture, rather than a super light and airy bread. That said, it’s still light, with just enough chew to make it a substantial loaf. This recipe was meant for making in a stand mixer, and not by hand. If you don’t have a stand mixer, it can be made by hand, but it will take longer to mix, and you will most likely want to reduce the amount of flour added by 1/4 cup. One of my biggest tips for bread making is DO NOT add too much flour in the mixing process. If you add too much flour to the dough, it will become difficult to handle or shape, and the rising process will also become inhibited. Adding flour should be done a little at a time. With this recipe, add the 2 cups of flour initially, then add the remaining flour a little at a time. When too much flour is added to the dough all at once, the dough takes longer to raise up and can become too stiff to handle. Follow the directions and only add flour as needed. Remember, you are looking for a soft, not sticky dough. Once the loaf is in the oven, it will fill your home with the most amazing smell. After it’s done baking you will have a tall, loaf of pure heaven! There are so many uses for this classic white bread. It’s perfect when sliced for sandwiches. You can toast it and slather it in butter and/or jam. IF you have any leftovers (big if) it makes amazing French toast. The possibilities are endless! If you love this bread, try ABK’s No Fail French Bread, the most amazing loaf of homemade French Bread you will ever eat, or Braided Cheese and Onion Bread . 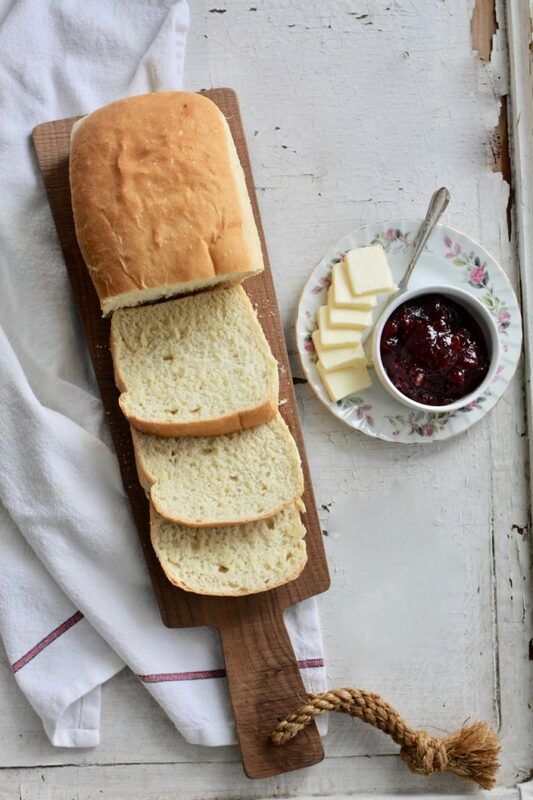 A simple and classic white bread recipe, perfect for slicing and topping with butter and jam! Place warm water in the bowl of a stand mixer. Sprinkle yeast and sugar over water in bowl. Let sit until yeast begins to bubble and foam in bowl. Add 2 cups bread flour, 1 teaspoon salt and 3 tablespoons melted unsalted butter to the mixing bowl. Turn the mixer on low speed with the paddle attachment and let mix for 2 minutes. Scrape down sides of bowl and paddle and mix for an additional 1-2 minutes on low. Add remaining 3/4 cup of bread flour, a little at a time, just until dough is no longer shiny and wet. Scrape down sides of bowl again. Spray sides of the bowl with cooking spray and cover the bowl with Saran wrap. Place in a warm draft free place* to rise about 20 minutes. Turn oven on to 375 degrees and place rack in center of oven. Grease a 8.5x4.5 inch loaf pan and set aside. When the dough has risen for about 20-30 mins, sprinkle a little flour on top and turn the dough a couple of times in the bowl so it is not sticky. Form into a loaf shape and place in the pan. Let rise again for about 20-30 minutes or until the dough is level with the top of the pan. Carefully place in preheated oven for about 40 minutes or until top is golden. Remove from oven let cool in pan for a few minutes then transfer loaf to a cooling rack. Brush with butter while still warm. To help the dough rise quickly, I rinse the bowl before placing ingredients inside with warm water. This warms up the bowl so the ingredients are never in contact with a cool surface. *I love to use the microwave as a place for bread to rise without draft. Heat one cup of water for about 1 minute in microwave. Remove cup of water and discard. The microwave will now be warmed up and ready to be used as a place for the bread to rise. Place the bowl with the bread dough into the microwave. Make sure to cover the bowl of bread with plastic wrap for best results. This will trap all of the heat inside of the bowl and help the bread to raise quicker. remember, do not use the water you heated up in the microwave, it was only used to warm up the microwave! The amount of flour you use will vary according to the temperature of the flour, the brand, your altitude, the amount of humidity on the day you are baking. I use about 2 3/4 cups of flour most of the time when baking this bread. Occasionally, a little more. Also, the bake time will vary depending on your oven, altitude, etc. Please watch your loaf carefully to determine how much time you need to bake. If the loaf seems to be getting a little too dark, loosely cover with a sheet of foil. The loaf may take 30 minutes to 45 to bake. If you don't have bread flour handy and want to make this bread, use all purpose flour instead. In this case, reduce the liquid in the recipe from 1 1/3 cups to 1 cup of warm water and then start out with 2 cups of all purpose flour and add additional flour after mixing for the first 2 minutes. All fo the other instructions stay the same! I’m excited to try this! Question about baking bread and cake breads… the middle of my bread takes so long to bake and the outsides get over cooked and hard. Can you give me any advice as to how I could change that? Hi Shelly, you could try covering the bread in foil halfway through the cooking time. Thanks for asking and hope this helps! Bread flour has a higher protein content than All Purpose flour. The protein in the bread flour allows gluten to develop and produces more of a dense and chewy texture. Hope this helps! I like to make at least 2 loaves at a time–does this recipe double well? This recipe is easily doubled, just make sure you have a large enough bowl for mixing properly! This is a delicious and easy to follow recipe. Thank you! One question. I’ve had some trouble with the bread falling apart after I cut it. Do I need to mix it longer to develop the gluten? I am not sure if this will help or not? Usually, mixing the bread will help the gluten to develop. This is a tender white bread, so yes it does come apart quite easily. If you want a bread that is more substantial, try adding a cup of wheat flour or bread flour and mixing on low with a bread hook for a couple of minutes.